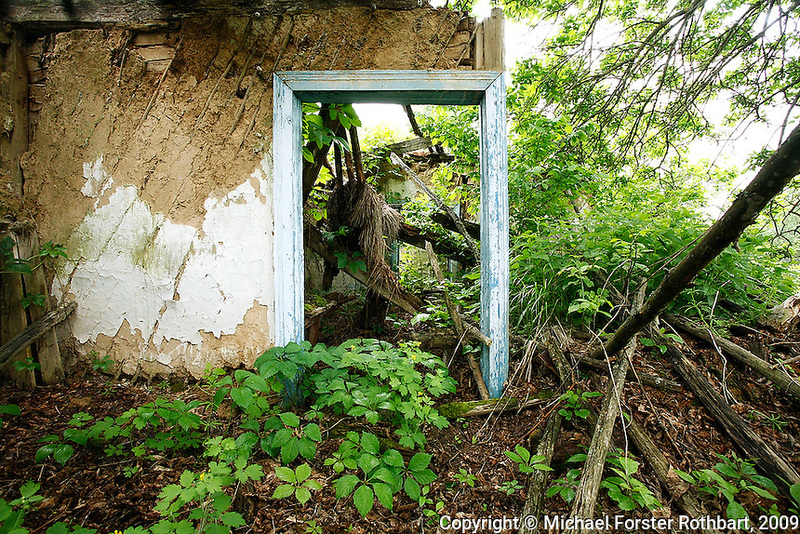 In the Chernobyl Exclusion Zone, abandoned village of Korogod, Ukraine, is slowly crumbling back into the forest. The buildings typically remain sturdy until a roof starts to leak, after which they quickly fall apart. Anything of value has been stolen from these buildings, including light bulbs and wiring. Original caption: .In the Chernobyl Exclusion Zone, the abandoned village of Korogod is slowly crumbling back into the forest. 9.5 miles south-southwest of the Chernobyl Nuclear Power Plant, this village was contaminated and evacuated after the 1986 Chernobyl accident. The buildings typically remain sturdy until a roof starts to leak, after which they quickly fall apart. Anything of value has been stolen from these buildings, including light bulbs and wiring. Today this is consider a relatively "clean" area of the Zone; on this day, the radiation levels here averaged just 0.06 mSv/hr (milliSieverts per hour) outside..-------------------.